KDE (/ˌkeɪdiːˈiː/) is an international free software community producing an integrated set of cross-platform applications designed to run on Linux, FreeBSD, Microsoft Windows, Solaris and Mac OS X systems. It is best known for its Plasma Desktop, a desktop environment provided as the default working environment on many Linux distributions, such as Kubuntu, Pardus and openSUSE. The goal of the community is to provide basic desktop functions and applications for daily needs as well as tools and documentation for developers to write stand-alone applications for the system. In this regard, the KDE project serves as an umbrella project for many standalone applications and smaller projects that are based on KDE technology. These include Calligra Suite, digiKam, Rekonq, K3b and many others. KDE software is based on the Qt framework. The original GPL version of this toolkit only existed for the X11 platform, but with the release of Qt 4, LGPL versions are available for all platforms. This allows KDE software based on Qt 4 to also be distributed to Microsoft Windows and Mac OS X.
KDE was founded in 1996 by Matthias Ettrich, who was then a student at the Eberhard Karls University of Tübingen. At the time, he was troubled by certain aspects of the Unix desktop. Among his concerns was that none of the applications looked, felt, or worked alike. He proposed the creation of not merely a set of applications but a desktop environment in which users could expect things to look, feel, and work consistently. He also wanted to make this desktop easy to use; one of his complaints about desktop applications of the time was that his girlfriend could not use them. His initial Usenet post spurred a lot of interest, and the KDE project was born. The name KDE was intended as a wordplay on the existing Common Desktop Environment, available for Unix systems. CDE was an X11-based user environment jointly developed by HP, IBM, and Sun through the X/Open consortium, with an interface and productivity tools based on the Motif graphical widget toolkit. It was supposed to be an intuitively easy-to-use desktop computer environment. The K was originally suggested to stand for "Kool", but it was quickly decided that the K should stand for nothing in particular. The KDE initialism is therefore expanded to "K Desktop Environment". Matthias Ettrich chose to use Trolltech’s Qt framework for the KDE project. Other programmers quickly started developing KDE/Qt applications, and by early 1997, a few applications were being released. On 12 July 1998 the first version of the desktop environment, called KDE 1.0, was released. In November 1998, the Qt framework was dual-licensed under the free and open source Q Public License (QPL) and a commercial license for proprietary software developers. The same year, the KDE Free Qt foundation was created which guarantees that Qt would fall under a variant of the very liberal BSD license should Trolltech cease to exist or no free version of Qt be released during 12 months. Debate continued about compatibility with the GNU General Public License (GPL), hence in September 2000 Trolltech made the Unix version of the Qt libraries available under the GPL in addition to the QPL which eliminated the concerns of the Free Software Foundation. Trolltech continued to require licenses for developing proprietary software with Qt. The core libraries of KDE are collectively licensed under the GNU LGPL but the only way for proprietary software to make use of them was to be developed under the terms of the Qt proprietary license. Starting with Qt 4.5, Qt was also made available under the LGPL version 2.1, now allowing proprietary applications to legally use the open source Qt version. On 24 November 2009 the KDE Marketing Team announced an official rebranding of the KDE project components, motivated by the perceived shift from building a desktop environment to a complete project around a community of "people who create software". The rebranding focused on de-emphasizing the desktop environment as "just another product", and emphasizing both the community and the other technologies provided as KDE software. After the repositioning, the name KDE no longer stands for K Desktop Environment, as it now acts as an umbrella brand for software produced by the community. What would have been previously known as KDE 4.4 will now be referred as "KDE Software Compilation 4.4" (abbreviated "KDE SC 4.4"). Regardless, many users still refer to it as KDE 4. The financial and legal matters of KDE are handled by KDE e.V., which is a German non-profit organization, and help organizing the conferences and meetings of the community members. KDE e.V. helps running the servers needed by the KDE community. It owns the trademark on KDE and the logo. It pays for travel to meetings, and subsidizes events. The working groups are a structure which will formalize some roles within KDE and enhance coordination within KDE, communication between parts of KDE. KDE e.V. has no influence on development. KDE e.V. logo has been contributed by David Vignoni. The three flags on top of the logo represent the three main tasks of the KDE e.V. : supporting the community, representing the community, and governing the community. The KDE community's developer meetings, servers and related events are frequently sponsored by individuals, universities, and businesses. The supporting members of the KDE e.V. are extraordinary members supporting the KDE through financial or material contributions. Supporting members are entitled to display the "Member of KDE" logo on their website or in printed materials. The Patron of KDE is the highest level of supporting member. The patrons of KDE also are entitled to display the exclusive "Patron of KDE" logo on their website or in printed materials. On 15 October 2006, it was announced that Mark Shuttleworth had become the first Patron of KDE. On 7 July 2007, it was announced that Intel Corporation and Novell had also become patrons of KDE. In January 2010, Google became a supporting member. On 9 June 2010, KDE e.V. launched the "Join the Game" campaign. This campaign promotes the idea of becoming a supporting member for individuals. It is made available for those who would like to support KDE, but do not have enough time to do so. 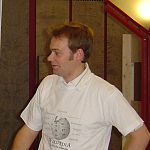 Georg Greve, founder of the Free Software Foundation Europe (FSFE) was first to 'join the game'. In many countries, KDE has local branches. These are either informal organizations (KDE India) or like the KDE e.V., given a legal form (KDE France). The local organizations hosts and maintains a regional website, and organising local events, such as tradeshows, contributor meetings and social community meetings. KDE-AR (KDE Argentina) is the group of KDE developers and users in Argentina, was officially opened in 22 November 2008 at the meeting in IRC channel. They can organize release parties on holidays to celebrate released of new version of the KDE SC since 4.2. KDE-AR has their own mailing lists and IRC channel. KDE Brasil is composed by several local groups in Brazil, like KDE-MG, Live Blue, KDE Piauí, and KDE-RS. The main goals of local groups are regional promotion and direction of contributions of members, and still maintaining harmony with the KDE Brazil community. KDE-MG is a local group in Minas Gerais. The idea of structuring the group was arose during the FISL (Fórum Internacional Software Livre) 10. Live Blue is a KDE working group in Bahia. KDE Piauí is a group of users and contributors of KDE in the Piauí. The ideia was born during the Software Freedom Day Teresina 2009 and has concretized during the Akademy-Br 2010, where the group was officially created. KDE-RS is a group of KDE users from Rio Grande do Sul. KDE Lovelace is a Brazilian female group of users and contributors in KDE. KDE España was registered as an association under the Spanish law in 2009. The aim is stimulating the development and use of the KDE software in Spain. The supreme governing body is general assembly, which is ordinary or extraordinary. The ordinary general assembly is held at least once a year. The extraordinary general assembly is held as necessary. The board consists of president, vice president, secretary, treasurer and members. Current board are Albert Astals Cid (president), Alejandro Fiestas Olivares (vice president), Aleix Pol i Gonzàlez (secretary), and José Millán Soto (treasurer). In addition, KDE España is the official representative of KDE e.V. in Spain. KDE.in (KDE India) was founded in 2005, provide Indian KDE developers and users with a community hub to coordinate with and support each other. Besides making efforts in the internationalization and localization, a major aim is to foster the creation and adaptation of KDE applications to needs specific to India. Japan KDE Users' Group (JKUG/日本 KDE ユーザ会 Nihon KDE Yūzakai?) is Japanese local users' group of KDE. The membership type of the association are corporate members (法人会員 hōjin kaiin?) and individual members (個人会員 kojin kaiin?). About 15 member is active staff. The officers include one president (会長 kaichō? ), two vice presidents (副会長 fuku-kaichō?) and one accountant. Currently, president is Daisuke Kameda (亀田大輔 Kameda Daisuke? ), vice presidents are Taiki Komoda (菰田泰生 Komoda Taiki?) and 暁 Satō (佐藤暁 Satō 暁?). The association will hold an annual general assembly in December. It's activities include message translation to Japanese, making patch for multilingualization, and exchanging information about KDE/Qt. KDE GB is a KDE community with a constitution in Britain. At October 2010 meeting they agreed to register as a charity. KDE-ir (فارسی KDE) is a Persian KDE community. Korean KDE Users Group was started in 1999. The group's work is mostly translation. The communication within the community takes place via mailing lists, IRC, blogs, forums, news announcements, wikis, and conferences. The community has the Code of Conduct for acceptable behaviour within the community. The mailing lists are one of the main communication channels, and most problems are discussed on here. The community has several mailing lists, has two general user lists: Kde for discussion of users, and Kde-announce for version updates, security patches and other changes. And two general development lists: Kde-devel, for communication of application developers, and Kde-core-devel for communication of development of KDE Platform. Many applications also have specific mailing lists. KDE Community Forums is also activity in discuss. The forums have Brainstorm for user submit ideas to developers. The wish can be approved or disapproved by other users. Every few months, the highest-voted features will then be submitted to the developers. The forums have IRC bots that can announce new threads and posts on IRC channels, briding forum posts to mailinglist messages and offering RSS feeds. KDE has three wikis: UserBase, TechBase and Community Wiki. UserBase provides documentation for end user. It contains tutorials, links to where to get more help, as well as an application catalogue. The logo is designed by Eugene Trounev. TechBase provides technical documentation for developers and system administrators. Community Wiki provides a place for coordinating community teams. It is used for publishing and sharing community-internal information. And IRC channels is real-time discuss way. Planet KDE is made from the blogs of KDE's contributors. KDE.News is the website of office news announcements. KDE Buzz tracks identi.ca, Twitter, Picasa, Flickr and YouTube to show social media activity concerning KDE. KDE Pastebin allows for posting of source code snippets and uses syntax highlighting which adds ease to reviewing code. The pastes can be password protected. And use RSS notification to get aware of new posts. KDE Bug Tracking System provides anyone, who report bugs that was found in the software. Bug tracking uses Bugzilla. Behind KDE is a site that interviews contributor of KDE. The KDE community’s mascot is a green dragon named Konqi. Konqi has a girlfriend named Katie. Konqi and Katie made their costumed appearance at the KDE 4.0 Release Event and Camp KDE 2010. Konqi also appeared on the KDE software's about dialog. Kandalf the wizard was the former mascot for the KDE community during its 1.x and 2.x versions, but he was dropped owing to copyright issues (his resemblance to Gandalf). KDE has community identity guidelines (CIG) for definitions and recommendations which help the community to establish a unique, characteristic, and appealing design. The KDE official logo displays the white trademarked K-Gear shape on a blue square with mitred corners.Copying of the KDE Logo is subject to the LGPL. Some local community logos are derivations of the official logo. The KDE software labels are used by producers of software to show that they are part of the KDE community or that they use the KDE Platform. There are three labels available. The Powered by KDE label is used to show that an application derives its strength from the KDE community and from the KDE development platform. The Built on the KDE Platform label indicates that the application uses the KDE platform. The Part of the KDE family label is used by application authors to identify themselves as being part of the KDE community. Like many free/open source software projects, KDE is primarily a volunteer effort, although various companies, such as Novell, Nokia, and Mandriva, employ developers to work on the project. Since a large number of individuals contribute to KDE in various ways (e.g. code, translation, artwork), organization of such a project is complex. The overall direction of the KDE Platform is made on the KDE Core Team. These are developers who have made significant contributions to KDE over a long period of time. This team communicates using the kde-core-devel mailing list, which is publicly archived and readable, but joining requires approval. KDE does not have a single central leader who can veto important decisions. Instead, the KDE core team consisting of several dozen contributors takes decisions. The decisions do not take a formal vote, but through discussions. The Developers also organize alongside topical teams. For example, the KDE Edu team develops free educational software. While these teams work mostly independent and do not all follow a common release schedule. Each team has its own messaging channels, both on IRC and on the mailinglists. And they have mentor program which helps beginner to get start. Currently KDE community uses the Git repository. KDE Projects site gives an overview of all projects within Git repository. QuickGit is another repository browser. It shows all the git repositories. ReviewBoard site gives patch review. Commitfilter will send an email with each commit for the projects you want to watch, without either getting tons of mails or getting infrequent and redundant information. English Breakfast Network (EBN) is a collection of machines that do automated KDE source artifact quality checking. The EBN provides KDE API documentation validation, user documentation validation, source code checking. It is operated by Adriaan de Groot and Allen Winter. Commit-Digest site gives a weekly overview of the development activity. LXR indexes classes and methods used in KDE. Season of KDE (SoK) is a program for people could not get accepted into Google Summer of Code. They will have a mentor from the KDE community to help them if any question arises or if they do not know how to continue. Over 6 million lines of code. This does not include Qt. More than 1800 contributors help develop KDE. About 20 new developers contribute their first code each month. KDE is translated in over 108 languages. KDE has more than 114 official FTP mirrors in over 34 countries. The KDE community is the second largest Free Software community behind the Linux kernel community. The KDE community has many smaller teams working towards specific goals. The Accessibility team make KDE accessible to all users, including those with physical handicaps. The Artists team has designed most of the artwork used by the software like icons, wallpapers and themes. They have also produced graphics for t-shirts and websites. Discuss of the team is most active on the IRC channel. The Bugsquad team keeps track of incoming bugs. They verify that a bug exists, that it is reproducible, and that the reporter has given enough information. The goal is to help developers notice valid bugs quicker, and to save their time. The Documentation team writing documentation for application. The team uses the DocBook format and custom tools to create documentation. The Localization team translate KDE software into many different languages. This team works beside the Documentation team. The Marketing and Promotion team manages marketing and promotion. The team writes news articles, release announcements and other webpages on KDE websites. The articles of KDE.News is submitted by the team. It also has channels at social media sites for communication and promotion. They also attend conference events. The Research team is to improve the collaboration with external parties to achieve more funded research. They support community members by providing information, navigating bureaucracies, and matching research partners. The usability team has written a Human Interface Guideline (HIG) for the developers and they do regular reviews of KDE applications. The HIG provides a standardized layout. The Web team maintains KDE’s web presence. The KDE Women help women to contribute and encourage women to give talks at conferences. The KDE community held KDE One that was first conference in Arnsberg, Germany in 1997 to discuss the first KDE release. Initially, each conference was numbered after the release, and not regular hold. Since 2003 the conferences were hold one a year. And they were named Akademy since 2004. Camp KDE is another annual contributor’s conference of the KDE community. The event provides a regional opportunity for contributors and enthusiasts to gather and share their experiences. It's free to all participants. It is intended to ensure that KDE in the world is not simply seen as being Euro-centric. The KDE e.V. helps travel and accommodation subsidies for presenters, BoF leaders, organizers or core contributor. It is held in the North America since 2009. Camp KDE 2009 was the premiere meeting of the KDE Americas, was held at the Travellers Beach Resort in Negril, Jamaica, sponsored by Google, Inte, iXsystem, KDE e.V. and Kitware. The event included 1-2 days of presentations, BoF meetings and hackathon sessions. Camp KDE 2010 took place at the University of California San Diego (UCSD) in La Jolla, USA. The schedule included presentations, BoFs, hackathons and a day trip. It started with a short introduction by Jeff Mitchell, who was the principal organizer of the conference, talked a bit of history about Camp KDE and some statistics about the KDE community. The talks of the event were relatively well attended, and an increase over the previous year to around 70 people. On 1/19, the social event was a tour of a local brewery. Camp KDE 2011 was held at Hotel Kabuki in San Francisco, USA, was co-located with the Linux Foundation Collaboration Summit. The schedule included presentations, hackathons and a party at Noisebridge. The conference opened with a introduction spoken by Celeste Lyn Paul. Akademy-es is a conference for Spanish community since 2006, aimed at Spanish speakers. The event is organized by Spanish local organization. KDE España organizes the event since 2008. The annual KDE España Assembly took place during the event. Akademy-es 2006 was held at Espai Jove Bocanord in Barcelona, organized by Badopi. Akademy-es 2007 was hosted by Hispalinux, Wireless Zaragoza, and the Zaragoza council. Akademy-es 2008 was held at University of A Coruña, was organized by the KDE España and GPUL, sponsored by Oficina de Software Libre de la Universidad de Coruña, Mancomun, Igalia, Qt Software and eyeOs. Akademy-es 2009 was held in the University of Las Palmas de Gran Canaria. Akademy-es 2010 was held in the Engineering Technical School of Bilbao, was organized by KDE España and Itsas. There were approximately 80 participants. The KDE España Assembly elected the new board consists of Albert Astals Cid (president), Rafael Fernández López (vice president), Aleix Pol (secretary), and José Millán Soto (treasurer). Akademy-es 2011 was organized by KDE España, was sponsored by Google and Nokia, and was supported by the Linux and Todo-Linux magazines. The event was held in the in two different locations: the Polytechnic University of Catalunya for presentations of fist day, The School of Sant Marc de Sarrià for last two day. Akademy-BR is addressed to Brazilian community since 2010. The purpose of the meeting is to gather and organize ideas Brazilian developers on how to help KDE in Brazil. Akademy-BR 2010 was organized by the local group named LiveBlue. There were thirty participants from all over the Brazil. Akademy-BR 2011 is organized by KDE-MG.
conf.KDE.in is the first KDE and Qt conference in India. The conference was organized by KDE India, was held at R.V. College of Engineering in Bengaluru, India. The first three days of the event had talks, tutorials and interactive sessions. The last two days were a focused code sprint. The conference was opened by its main organiser Pradeepto Bhattacharya, over 300 people were at the opening talks. The Lighting of the Auspicious Lamp ceremony was performed to open the conference. The first session was by Lydia Pintscher who talk "So much to do – so little time". At the event, Project Neon announced return on Mar 11, 2011, provides nightly builds of the KDE Software Compilation. Closing the conference was keynote speaker and old-time KDE developer Sirtaj. Día KDE (KDE Day) is a Argentinian event focused on KDE. It gives talks and workshops. The purpose of the event are: spread the free software movement among the population of Argentina, bringing to it the KDE community and environment developed by it, to know and strengthen KDE-AR, and generally bring the community together to have fun. The event is free. Release party is a party, which celebrates released of new version of the KDE SC (twice a year). KDE also participates other conferences that around free software. In addition to Camp KDE and Akademy there are other conferences, which is called Developer Sprints. The Developer Sprints are focused gatherings of developers to work on a specific part of KDE. Usually there are 2–3 days meetings of around 10-15 people. The Developer Sprints include core people, but also least one or two newbie quota to get fresh developers into the community. They are supported by KDE e.V. financially and organizationally. It will also provide help and advice where needed and appropriate. The results of meetings are documented on the KDE.News. They also create a sprint landing page on the community wiki, which give a brief summary of the sprint and link to relevant material. KDE PIM Meeting is the annual meeting of KDE PIM team, held in Osnabrück, Germany since 2003. Akonadi Sprint is anther meeting of KDE PIM team since 2007; it focus on Akonadi. Calligra Sprint is the meeting of designers and developers of Calligra Suite. Usually the meetings are held in Berlin, Germany. Krita Sprint is the meeting of Krita team since 2009. KDE Education Meeting is the meeting of KDE Edu team. KDE Marble sprint is the meeting of Marble team, held in Nürnberg, Germany. KDE Games Sprint is the meeting of KDE Games team. KDE Imaging Sprint is a sprint for KDE photography applications. Tokamak is the meeting of designers and developers of Plasma, KWin, and Oxygen since 2008. KDE Finances Sprint is the meeting of developers from KMyMoney, Kraft and Skrooge. Promo sprint is the meeting, which discuses KDE Marketing and Promo. The KDE technology platform consists of three parts: KDE Development Platform, KDE Workspace and KDE Applications. 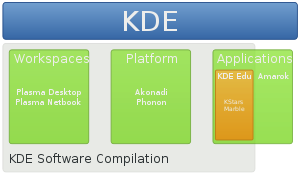 KDE Platform consists of the libraries and services needed to run KDE applications. libraries include: Solid, Nepomuk, Phonon, etc. Packages include: kdelibs, kdepimlibs and kdebase-runtime. The libraries must be licensed under one of the LGPL, BSD license, MIT License and X11 license. While the Platform is mainly written in C++, it includes bindings for other programming languages. The Plasma Workspaces provide the environment for running and managing applications. They include many components such as KWin, KDM, Plasma core libraries, Klipper, KSysguard, and System Settings. 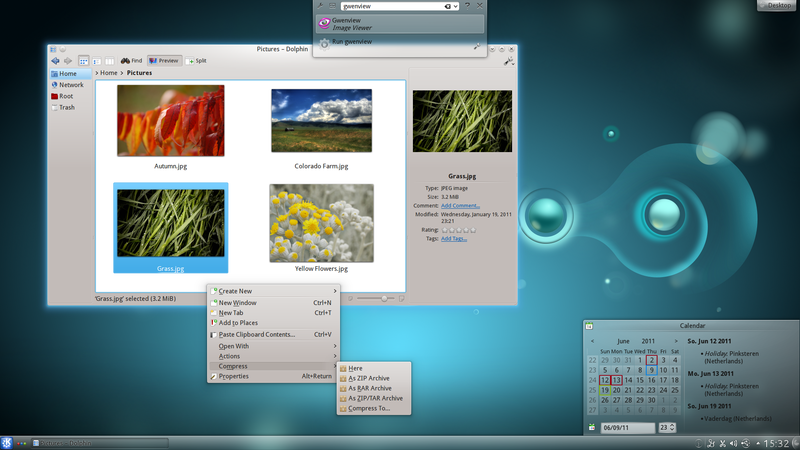 There are different available GUI environments: Plasma Desktop for desktop computers, Plasma Netbook for netbooks, Plasma Mobile for smartphones and Plasma Tablet for Tablet PCs. KDE Applications are built on top of the KDE Platform like Okular, KTorrent, Kexi and KDE Partition Manager. KDE applications can potentially be portable between operating systems and independent of a particular workspace or desktop environment. 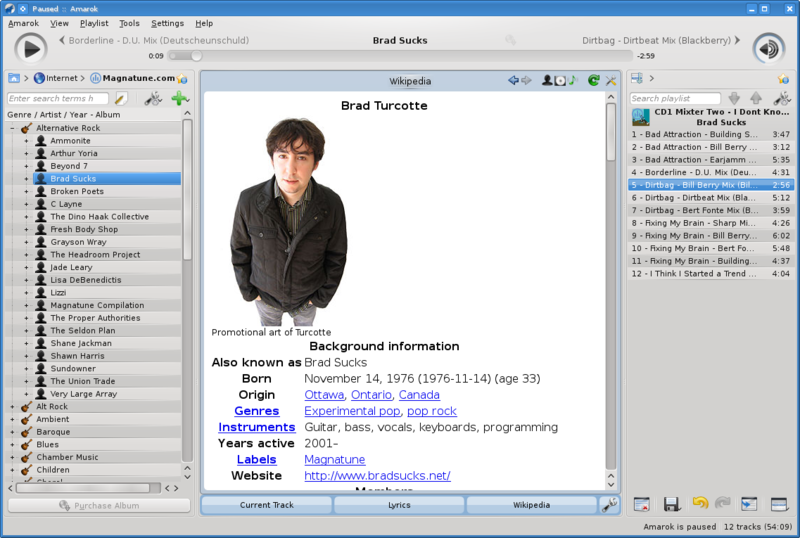 Some brands identify application suites built up from several applications, such as KDE Network, KDE Graphics and KDE Utilities. Some applications are part of the regular Software Compilation releases, others are part of Extragear and release to their own schedule. Most KDE software uses the Qt framework which runs on most Unix and Unix-like systems, Mac OS X, and Microsoft Windows. As of 2011 CMake serves as the build tool. This allows KDE to support a wider range of platforms, including Microsoft Windows. GNU gettext is used for translation. Doxygen is used to generate api documentation. KDE Software Compilation: KDE Software Compilation (KDE SC) is the coordinated releases of new software versions, gathering elements from the previous components to build an integrated core of software. The KDE SC is not a product as a single entity. Calligra Suite: Integrated office suite. KDE-Extragear: Extragear is a collection of applications associated with KDE. Those applications are not part the official software compilation, but they are still part of the project. KDE-Playground: This package contains pre-release and unstable software. It is a place for applications to mature. On 4 April 2008, the KDE e.V. and Wikimedia Deutschland have opened shared offices in Frankfurt. 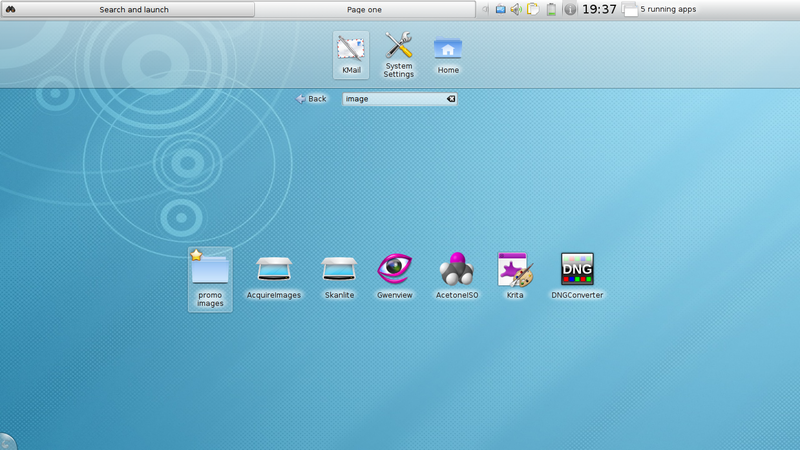 In September 2009 KDE e.V. moved to shared offices with Free Software Foundation Europe in Berlin, so Wikimedia Foundation now uses the Frankfurt offices for themselves. On 22 August 2008, KDE e.V. and FSFE announced that after working with FSFE’s Freedom Task Force one and a half years KDE adopts FSFE’s Fiduciary Licence Agreement. Using that, KDE developers can – on a voluntary basis – assign their copyrights to KDE e.V. Several companies actively contribute to KDE, like Collabora, Erfrakon, Intevation GmbH, Kolab Konsortium, Klarälvdalens Datakonsult AB (KDAB), and KO GmbH. Nokia use Calligra Suite as base for their Office Viewer application for Maemo/MeeGo. They have also been contracting KO GmbH to bring MS Office 2007 file format filters to Calligra. Nokia also employs several KDE developers directly – either to use KDE software for MeeGo (e.g. KCal) or as sponsorship. Since 2009, GNOME and KDE co-host their conferences Akademy and GUADEC every two years under the Desktop Summit label. Many Linux distributions and other free operating systems are involved in the development and distribution of the software, and are therefore also active in the KDE community. These include commercial distributors such as Novell, Mandriva, Red Hat, or Canonical, but also government-funded non-commercial organizations such as the Scientific and Technological Research Council of Turkey with its Linux distribution Pardus. Brazil’s primary school education system operates computers running KDE software, includes more than 42,000 schools in 4,000 cities, serving nearly 52 million children. The base distribution is called Educational Linux, which is based on Kubuntu. Besides this, a thousand more students in Brazil use KDE products in their universities. KDE software is also running on computers in Portuguese and Venezuelan schools, with respectively 700 thousand and one million systems reached. Germany uses KDE software in its embassies around the world, representing around 11,000 systems. Through use of Pardus, a local Linux distribution, many sections of the Turkish government make use of KDE software, including the Turkish Armed Forces, Ministry of Foreign Affairs, Ministry of National Defence, Turkish Police, and the SGK (Social Security Institution of Turkey), although these departments often do not exclusively use Pardus as their operating system. The CERN (European Organization for Nuclear Research) built the Large Hadron Collider in Switzerland, one of the world’s largest science experiments, using KDE software.